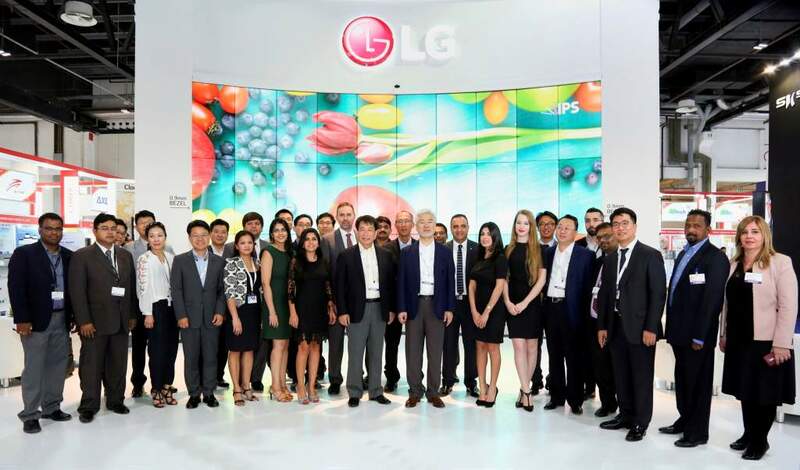 Karachi / Dubai, October 27, 2015: In response to the demand for creative marketing display solutions, LG Electronics has pushed boundaries with the global launch of the world’s narrowest bezel video wall at GITEX Technology Week in Dubai. In addition to the global launch, the world’s leading innovator of display technologies, has chosen the 35th edition of GITEX Technology Week, to unveil its robust portfolio of cutting-edge display solutions catered to the evolving needs of vertical industries in the Middle East region. The all-new UHD video wall display is redefining the video wall space with its unprecedented thin bezel, and features distinct new innovations that address the largest issues video wall customers face today. With its super slim bezel size, the VH7B Direct Backlit LED Display video wall measures just at 0.9 mm, offering the most seamless and immersive display solution. The VH7B video wall fully caters to the strong for various sectors including airports, shopping centres and hotels. “LG is yet again pushing boundaries and raising the bar for video displays with the launch of the world’s narrowest bezel video wall. LG’s innovating technology comes from market intelligence and understanding what our customers want and resulting in solutions that truly enhance their business models. The global debut of the world’s narrowest bezel video wall at GITEX is testament to this,” said Mr. Kevin Cha, President, Middle East & Africa Region LG Electronics. The ground breaking video wall display features LG’s “webOS for Signage” smart platform, which takes advantage of the built-in high-performance system-on-a-chip (SoC) sync playback that eliminates the need for an external PC or media player to play contents for daisy chain, helping to reduce the total cost of ownership. LG’s webOS for Signage enables a variety of web-based applications across multiple platforms, as well as the ability to write applications using HTML 5. The advantage of this platform is the ease of management and customisation for third party solution providers which makes lives easier for all stakeholders. 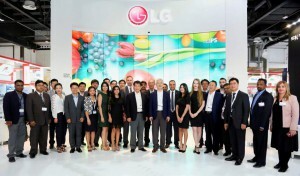 In addition to the global debut, a range of display solutions currently being showcased include the 98” ULTRA HD 4K premium signage display, 84” 10-point touch white board, the new ultra stretched 86” display, and the innovative LG beacon solution demonstrated on 10” compact touch screens. Also on display will be the UHD premium Hospitality TV UX960H designed to provide a connected guest in-room experience. These solutions are catered for a range of vertical industries including retail, education and hospitality. At the week-long event, LG will engage with several potential and existing customers, along with its growing array of systems integrators, partners and consultants by showcasing how its leading product and solution portfolio can empower regional enterprises. With a focus on higher brightness, best picture quality and energy-efficient displays, the digital leader continues to set the benchmark in the signage industry. Until Thursday, LG Information Display will be exhibiting its solutions in Hall 2 at Stand D2-1, at the Dubai International Convention & Exhibition Centre, UAE. For more information on LG’s B2B products and solutions, please visit www.lgecommercial.com.